We’ll be announcing what’s on regularly in the lead up to the festival, watch this space, mark your interest on facebook and subscribe to our newsletter at the bottom of this page. Camper Calling at it's heart is a Family Friendly Music Festival, so expect a lot of music and a lot of fun for the whole family. New for 2019 - You can now join the calling earlier by purchasing Thursday night camping passes. There are a limited quantity available that allow you to arrive between 2pm and 8pm on Thursday where you can enjoy a selection of food, drink and entertainment in the evening before the full programme begins on Friday. Serving up the freshest tunes from the newest home grown and international artists, you’ll find your new favourites on the Freshly Squeezed Stage. We’re passionate at Camper Calling about the future of music, and by working with BBC West Midlands Introducing we want to give up and coming artists the opportunity to grow, play and entertain! Playing all weekend, come chill out in the heart of the show, grab a beer and find a new summer love for your Calling playlist. Each morning we'll get you up, motivated and ready for the Calling with our lively and energetic dance classes. Plus, throughout the weekend there will be numerous dance workshops. From Tango to Salsa, African to Break Dancing, there's something for everyone to join in with, whether you're a beginner or a two-stepping pro! Finally, as the sun sets each evening, we'll top off your night with a headliner that is guaranteed to make you dance till you drop. Keep a look out over the next few weeks for Dance Big Top announcements and whether you're raving or behaving, you won't be disappointed. Workshops and classes here are not pre-bookable, just turn up to take part. We’ll be announcing them here as and when they’re confirmed. Each night our big top bar will be taken over by sensational acts and the opportunity to get dressed up for with a different theme each night. FRIDAY night is made for DISCO at Camper Calling. We are thrilled to welcome Uncle Funk & The Boogie Wonderband back to our NEW Bar Big Top, ready to get you in the party mood! Fancy Dress is strongly encouraged to get in the groove, flares, wigs, glasses and as much chest hair as you dare! The outrageous group have performed at Glastonbury and the disco legends will be shimmering with top hits, dance moves and non-stop funk! See you on the dancefloor! Prost! 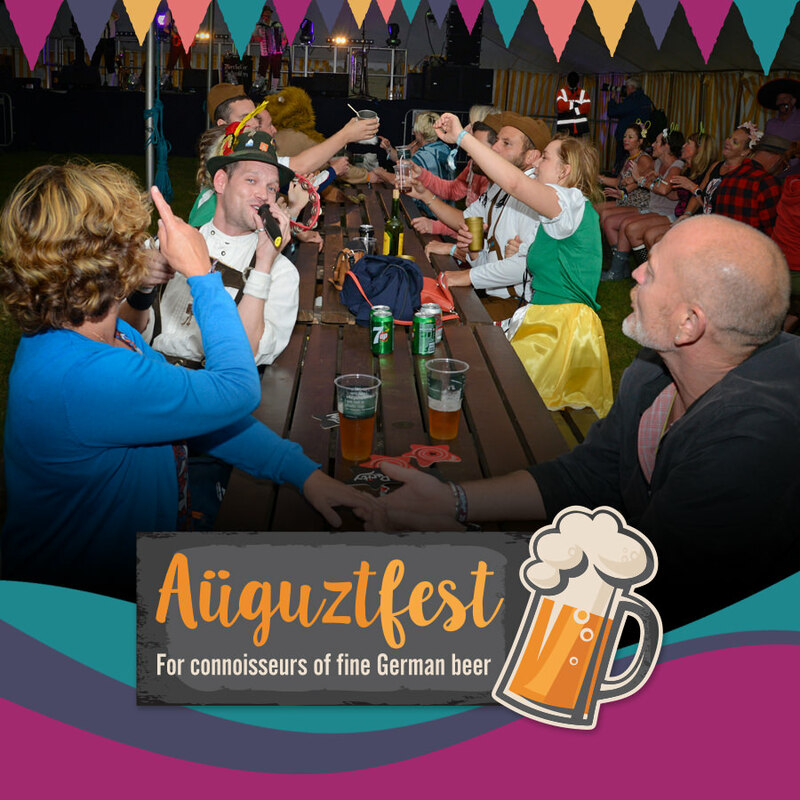 Raise your stein for the return of SATURDAY nights Auguztfest where we welcome back the fantastic Bierkeller Schunklers! Held in our NEW Bar Big Top, the evening kicks off with performances from our renowned Oompah band! Come in Fancy Dress and get those lederhosen on! They are all about crowd participation, so bring your hands for clapping, your lungs for laughing and feet for shuffling! The atmosphere is sure to be buzzing, and don’t worry, we’ll have plenty of refreshments for you to toe tap and thigh slap the night away! SUNDAY night is SKA night in our Bar Big Top. Baked A La Ska are an 11 piece band of assembled oddballs and pranksters brought together by keyboardist and wizard, Mr John Ellis, and have been taking audiences across the nation by storm. Fancy Dress is strongly encouraged to get yourself skanking too. Black & white, trilbys, dark shades and even a fez, will all add to the incredible atmosphere Baked A La Ska will be bringing in our NEW Bar Big Top.